We’d love your help. Let us know what’s wrong with this preview of The Night Library by David Zeltser. After a young boy goes to sleep upset that he's getting a book for his birthday, he's visited in the night by Patience and Fortitude, the two stone lions who guard the New York Public Library. Soon, he's magi The Polar Express meets The Night at the Museum in this fantastical picture-book adventure about the magic of books and libraries, perfect for book lovers of all ages! To ask other readers questions about The Night Library, please sign up. A beautiful book, one which pairs a sensitive and thought-provoking story about the power of reading with gorgeous artwork, The Night Library is the third title I have read recently to feature Patience and Fortitude, the two stone lions who stand guard outside of The New York Public Library's 42nd Street Astor Hall. 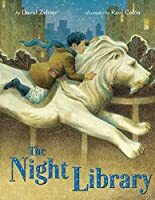 The previous two, Josh Funk's Lost in the Library: A Story of Patience & Fortitude and Jessica M. Boehman's The Lions at Night , were each interesting, in their way, but I think this one is outstanding! Author David Zeltser highlights how influential childhood reading can be, and the all-important role of family members in fostering a literate environment for young people. He also explores how the death of a loved one, in this case the boy's grandfather, can interrupt that process. He never explicitly states that the boy stopped reading because his grandfather died, but there is a strong implication that this is the case, and that without the encouragement of this beloved elder, he begins to get out of the habit of picking up books for pleasure. The story therefore functions, not just as an exploration of reading, but of the grieving and healing process, after the death of a loved one. As could be expected, the artwork by Raúl Colón is simply beautiful, with a gorgeous dream-like quality that perfectly matches the story. I think this may be my favorite yet, of Colón's books! My favorite line is when the adult books are flying off the shelves and they skitter and jump away from the boy, to which the lion says, "Adult books can be difficult to grasp...Let's go to the children's section." So great and magical! The illustrations are gorgeous and quietly grand, full of warmth and wonder. The words are graceful and satisfying. The story is well-paced and delightful. I will happily read this again and again! The art in this was gorgeous, and there was a very touching message about nostalgia and learning to love the painful memories related to loss once more. I love picture books about the lions guarding the New York Public Library. This is my new favorite. The Author's Note made me cry. I love this book! So glad I wrote it up for our library. A lot of books coming out about the NYPL, but this is by far the most stunning- visually, and such a strong story to support it. Loved it. Beautiful dreamy illustrations, but clunky story and text. A lovely and touching story with wonderful illustrations. A tender story about a boy who stopped loving to read when he lost his grandfather and how a pair of literary lions helps him rediscover the magic of books. Gorgeous illustrations. As a lover of All Things Library, this book serves as an excellent reminder of the magic of books, how books can transcend the life of a child, and how important it is to instill a love of reading from a young age. A boy is disappointed when he receives a book for his birthday present, but remembers his love of reading after a visit from Patience and Fortitude, the two lions who stand guard outside the New York Public Library. David Zeltser is the author of Lug: Dawn of the Ice Age and its sequel, Lug: Blast from the North. The novels satirize mankind’s response to climate change and have been praised by Kirkus Reviews, School Library Journal and Al Gore, who called the first book “a great combination of humor and powerful insight.” David’s first picture book, Ninja Baby, was the Magnolia State Book Award runner-up, fea David Zeltser is the author of Lug: Dawn of the Ice Age and its sequel, Lug: Blast from the North. The novels satirize mankind’s response to climate change and have been praised by Kirkus Reviews, School Library Journal and Al Gore, who called the first book “a great combination of humor and powerful insight.” David’s first picture book, Ninja Baby, was the Magnolia State Book Award runner-up, featured in USA Today, and received a starred review from Publishers Weekly, which called it “a funny and pitch-perfect story.” It was illustrated by Caldecott Honor-winning artist Diane Goode and published by Chronicle Books. David’s most recent picture book was The Universe Ate My Homework, illustrated by Ayesha Rubio, which received rave reviews from Kirkus, School Library Journal, and NPR Science Journalist and Radiolab co-host Robert Krulwich, who then lent his voice to the trailer. Forthcoming books include Codzilla, illustrated by Jared Chapman, from HarperCollins; and The Night Library, illustrated by Raul Colon, from Random House. David also co-wrote the screenplay Solo, which will be directed by Joseph Greco (writer/director of Canvas) and Executive Produced by Bruce Beresford (director of Driving Miss Daisy).